Cerdo Asado and the Havana Cafe Sandwich. 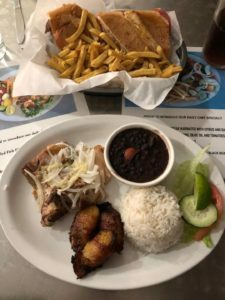 Havana Cafe has been open for a few years now, and I attempted to review it when it was first open. Unfortunately, my experience was not a positive one, so I did not write about it. I put Havana Cafe on the back burner and visited other spots around town. Finally, I was able to return and I’m happy to say that my recent visits were definitely better than that first one. Cuban food is mostly inspired by the mix of Spanish, African, Mexican and Caribbean influences brought to the island by Spanish settlers and their African slaves. French and Asian immigrants also brought food traditions with them, resulting in a varied and unique cuisine. Plantains (brought from Africa) play a large role in Cuban cuisine, as do black beans (native to the Americas) and rice (from Spain and Africa). Spices like annatto and cumin add character, as do herbs like oregano and bay leaves. All of these flavors come into play in the dishes that are being served at Havana Cafe. A cerdo asado (roasted pork) was tender, from a long braise, but needed a little seasoning, either some salt or a squeeze of lime. With that addition, the sweetness of the pork and the spicy oregano really shone. Havana Cafe Bistec was the other side of the coin: the flavor of the mojo (orange-garlic sauce) was right up front, but the steak was much less tender than it could have been. Chicken fricassee illustrates the French influence on Cuban cooking. The dish is prepared here with annatto and olives instead of the traditional white wine and mushrooms, which add interesting layers of flavor, while potatoes add body to the dish. This was something I’d definitely order again. The chicken was falling off the bone and the potatoes were tender and tasty. Entrees are served with a side of beautifully cooked plantains, as well as sides of black beans and rice. The Havana Cafe Sandwich is a twist on the classic Cuban sandwich, with Genoa salami joining the classic ham, pork, Swiss and pickles. It’s griddled, just like a Cuban. This is a hard sandwich to mess up, but it’s also difficult to make a version that is extraordinary. Havana Cafe’s version is good, with crisp bread and a moist interior. A side of fries was well-seasoned and crisp. Cuban tamales are a little different than Mexican ones in that the masa is wetter and the fillings tend to be mixed into it rather than just in the center. These were tasty every time, but the texture and seasoning varied wildly. Empanadas were a real disappointment; they were not evenly fried and there was so little filling I had to cut it open to find it. What was there had lovely flavor, but again, they were inconsistent. On one plate of empanadas I found three very different mixes of filling. One was loaded with olives, while another had none. Service is friendly; the atmosphere on the cafe side is not the best, and often the only background noise is murmured conversations among the employees. A little music would make the experience much less awkward (especially when we are the only ones there). Cuban food is pretty hard to find in Dallas, so I love that I have a spot for it nearby. While I wish the dishes were more consistent, they definitely satisfy any Cuban cravings I have.